In addition to our all-state honors, which will be released next week along with stat leaders from the season. We have released our 2018 All-Tournament Team. To be eligible for the five member list per class, you had to play in at least two games at the 2018 state tournament this season. We also noted impressive performances in opening round loss. PARENTS/ATHLETE/COACH: To order your All-Tournament Team Patch from Sports in Kansas email Chet Kuplen at sportsinkansas@gmail.com. You can also wait to order these with the all-state and stat leader patches on Sunday. Brown had 18 points and nine boards in the quarterfinal, 23 points and nine boards in the semifinal and although not big on the scoring end in the state title game she dominated defensively with five blocks to go along with eight points and six boards. The 6-foot-6 junior is one of the top players in the country. Carly Bachelor, Washburn Rural, Jr. Bachelor could have made a case for MOP as well as her team took third and she was the top scorer in the tournament with 76 points over three tournament games for the Junior Blues. She also had 39 rebounds and has committed to Creighton. First Round Impressive Performance in Loss: Christiana Carr of Manhattan, who won it all last year, had 15 points in the opening round game but came up short in a loss to Washburn Rural. She will be one to look for when our all-state lists come out next Sunday. Weledji didn’t blow up the scoreboard but got it done on both sides of the court and had 21 rebounds over the tournament to go along with 41 total points over three tournament games to lead her team to their third consecutive state title in 5A. She had 17, 15 and nine over the three contests to give her 41 total points for the tournament. First Round Impressive Performance in Loss: Claire Kaifes and Evan Zars combined for 30 points in the Mill Valley loss in round one but didn’t make it into the final four but two very good players. Zars has signed with St. Louis at the Division I level. Robertson led McPherson to their first state title in six years and scored 65 points over three tournament games including 21 in the championship. She also hit clutch free throws to give the Pups the win in OT over Miege. It was a total team effort with the Pups as many could have been on the All-Tournament list with big tourneys from Robertson, Mandi Cooks, Riley Hett, Lakyn Schieferecke, Emma Ruddle, Grace Pyle, Andrea Sweat and Hannah Haggeman. Tristan Gegg, Labette County Sr.
Gegg is one of the best scorers in Kansas history with over 2,000 career points. She lit up the 2018 state tournament with 74 total points over three contests. She had 31 against McPherson in the semifinal loss. First Round Impressive Performance in Loss: Ady Edwards had 21 points for Paola in the opening round loss to Piper, while Maddie Livingston of Augusta had 18 points and 10 boards in the loss to McPherson in the quarterfinals. Ogle scored 63 points over three tournament games to bring the first title for girls’ basketball back to Baldwin in 22 years. She was outstanding in the semifinal with 28 as well as the final with 22. She played just 11 minutes in the opening round blowout of Frontenac and scored 13 otherwise you may have seen her with another 20 plus point game. Ogle scored 63 points over the 2018 state tournament to capture the 4A-II title. First Round Impressive Performance in Loss: Delaney Barnes of Baxter Springs scored 26 points and had eight rebounds in the opening round loss to Huguton. Barnes, just a sophomore, scored 26 of her teams 35 points. Kayla Vitztum had an outstanding tournament for TMP as they took fourth place. She paced the Monarchs with a 21 points per game scoring average for 63 total points over three tournament games to lead all scorers at the 3A tourney in Hutchinson. First Round Impressive Performance in Loss: Sydney Dwyer had 20 points in her final game as a Wellsville player in the opening round loss to TMP. Emily Ryan, Central Plains Soph. Ryan scored 83 points over three tournament games as Central Plains cruised to their fifth consecutive state title under head coach Pat Stiles. 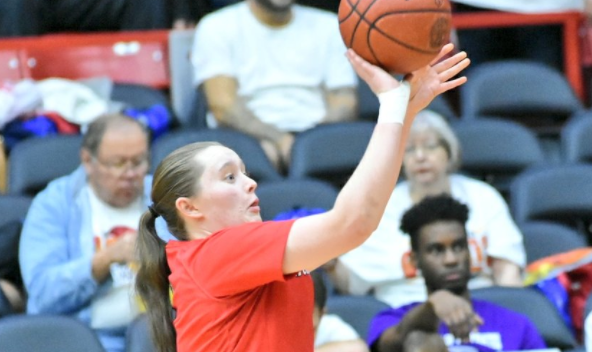 Despite struggling from the 3-point line in the title game she still had an unbelievable all-around game with 25 points, seven assists, six blocks, and eight rebounds from her point guard position. Ryan has been the most complete player in Kansas this season on both ends of the floor. Ryan, also the MOP above, scored 83 points over three tournament games. Not too far behind was All-Tournament pick Brianna Vogts of Olpe who had 76 points in three tournament games. Vogts finished with over 1,500 career points and we expect Ryan to reach the 2,000 point mark next year as a junior. First Round Impressive Performance in Loss: Kathy Farmer, junior at St. Mary’s Colgan, had a huge game at state that almost saw the Panthers get their first ever win at the state tournament. She had 29 points and eight rebounds for the Panthers who lost to Hill City (50-49) in overtime. Hanover repeated in 1A-I and a big reason was Doebele who went over her 1,000th career point in the quarterfinal over Frankfort. She scored 63 points over three tournament games to lead all 1A-I tournament scorers in the field. She wasn’t a one person show either as Tianna Lohse and Claire Zarbynicky had outstanding tournaments and were also named to the all-tourney team above. She doubles up on both of the honors here as her 63 points were the most at the state tourney in 2018 for 1A-I girls. She had 24 in the opening round, 20 in the semifinal and 19 in the title game. First Round Impressive Performance in Loss: Keenen Brandt of Frankfort had 18 poitns and nine rebounds in the 50-47 loss to eventual champion Hanover in the first round. Bolen and Hartford may have gotten second place but she was the primary reason they got into the state tournament for the first time in program history. She also had 44 points and 29 rebounds over the state tournament. First in rebounds among all players and second in points in the 1A-II Tournament. Meyers didn’t score in the semifinal but had the two of the biggest games in the tourney in the opening round with 24 and 21 in the third-place game to lead all 1A-II scorers at the state tourney. First Round Impressive Performance in Loss: Avery Gates of St. Johns/Tipton had 22 points and four assists in the opening round loss (66-64) to Axtell. Teammates Lauryn Dubbert and Kara Eilert also had big outings with 16 and 17 (15 rebounds) respectively.